​OKLand® Stirrups for Lithotomy Surgeries are adjustable in all directions, they fully cater the positioning requirements of patients during Lithotomy surgeries. The stirrups greatly reduce work loads of clinical staff, enhancing surgery efficiency and safety. 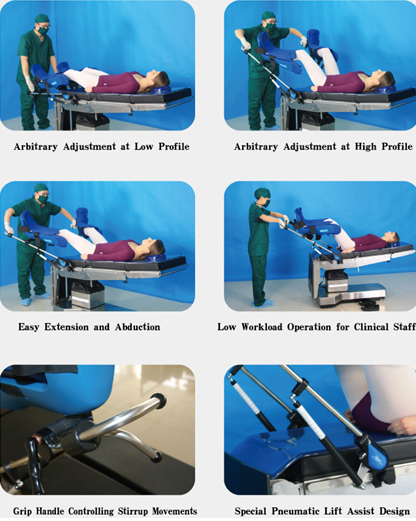 Easy and complete control of lithotomy and abduction, enlarging operation vision field. Even during operation, clinical staff can easily reposition or adjust the legs in a sterile state. 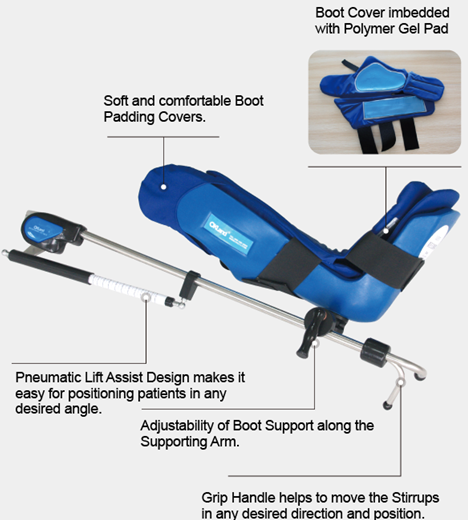 Pneumatic Lift Assist Stirrups will make it extremely easy to adjust legs to desired position. The unique design of protecting wings will help to reduce pressure on popliteal fossa and gastrocnemius muscle. In the positioning of stirrups, the boots will automatically adjust to reduce pressure on gastrocnemius muscles. Foot, ankle and calf will be fully wrapped in the protective cover pad. Positioning angles will be accurately indicated on the Meter Reader. The unique design of protecting wings of stirrups eliminates the potential damage to peroneal nevers, and greatly reduces pressure on claves. In high degree of lithotomy surgeries, the protecting wings will efficiently protect patients' knees. Without the protection, the knees will tend to drop outward and downward, causing stretching of groin and lumbar muscles.